Olympus has updated the software for this camera. Read the full article on sansmirror.com. Nov 28 The Nikon Df isn’t a Sellout. I’ve found multiple dealers with Df cameras in stock a day after it started shipping in the US. It’s no D800 (five month wait list). Nov 27 New 12mm Fisheye lens for Fujifilm XF and Sony E-Mount. Calling this "compact" is a bit of a misnomer, as it's not close to a shirt pocket camera. It's more the size of a small rangefinder camera. Read the full review on gearophile.com. Nov 25 User Repair Experience adds an issue encountered with warranty on a Amazon UK purchase. I’m following up my original article with a few more thoughts. Read the full article on gearophile.com. Russell Brown’s recent foray into quadracopters (darn, now everyone is going to try what I was playing with) raised the drone volume in my In Box. But one email was particularly on point. What is the ultimate camera for a drone, and how do we control it? Read the full article on gearophile.com. It’s the worldwide economy. It’s the rise of smartphones. It’s the mature market. It’s that Americans aren’t using their credit cards. It’s that digital cameras are “good enough” now. It’s the slower growth in the BRICs. In the last year or two we’ve heard pretty much every one of those things and more to explain why camera sales are on the decline. Read the full article on dslrbodies.com. RawDigger has now reached 1.0 status and officially a product. Three versions (Windows and Macintosh) are available Read the full story on dslrbodies.com. Starting today and running through December 2nd, Adobe is opening the US$9.99/month offer to everyone, regardless of whether you previously owned Photoshop or not. Read the full story on dslrbodies.com. 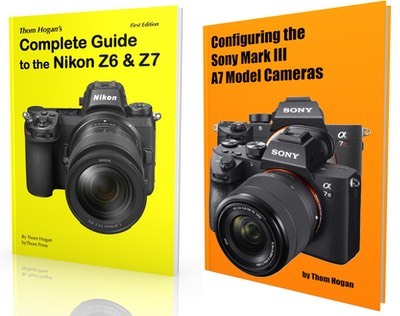 This is the second of a series of articles on my recommendations for holiday buying, targeting mirrorless systems. Full article on sansmirror.com. You don’t expect the New York Times to publish misleading statements (or at least statements that can be easily misinterpreted), but that’s what they’ve done in a recent article on Fujifilm’s X-series. Read the full article on sansmirror.com. Nikon has posted some follow-up Q&A to their first half financial results, and, as usual, it’s a mumbo jumbo of boilerplate Japanese excuseplanations along with some reading-between-the-lines truths. Read my translation on dslrbodies.com. Early on, the mirrorless makers thought that the lower-end cameras would be…the meat of the market. Read the full article on sansmirror.com. We're coming into the busy holiday buying season, and in order to cut down the number of "what should I buy" emails I get (or at least focus them better), I though I'd summarize my thoughts in a series of articles. This is the first. Read the full article on dslrbodies.com. An email from a reader got me thinking about reducing the verbiage on my point about the decline in camera sales. Read the two-statement answer on gearophile.com. Nov 12 Blackmagic Design Pocket Cinema Camera Gets CinemaDNG RAW Update. Read the full story on sansmirror.com. Nov 12 Tough Camera Questions Answered. Read the full Q&A on dslrbodies.com. EOS M version of the Franiec anodized aluminum grip now available. Read the full article on sansmirror.com. Is the US getting a bunch of new lenses the rest of the world isn't? (Short answer: no) Read the full article on dslrbodies.com. The RX100 is the original 1" sensor Cyber-shot compact camera from Sony, with the RX100II being a modest update. Both are available currently, so be careful to make sure you know which one you're getting and why. Read the full review on gearophile.com. Nov 9 Thom's Gear Cleanout Sale Continues. New gear has been posted. As we get the quarterly financial reports from the camera companies and the latest CIPA numbers, we can see a number of small changes happening in the market. Read the full article on sansmirror.com. Nov 7 Botswana Safari Wrap-up read the full article on bythom.com. Nov 7 Fujifilm lens firmware updates to support X-E2 body. Nov 7 New data pages for Pentax 08 Wide Angle Lens (Q system) and Tamron 150-600mm f/5-6.3 VC (FX). Nikon posted results for the first half of their fiscal year today, and the news is mixed. Read the full story on dslrbodies.com. Products that are different than expectations tend to cause a lot of intense debate. No product is "all bad" or "all good." Read the full article on dslrbodies.com. Google recently added another filter to the Nik Collection (Analog Efex Pro). Read the full article on dslrbodies.com. As I expected, the Internet is blowing hot and cold on this camera. Lots of emotional reactions to price, features, and design. Read the full article on dslrbodies.com. So what to make of Nikon's new DSLR, the Nikon Df? Read the full article on dslrbodies.com. Every day I get another of these emails from customers who are leaking away from Nikon DSLR bodies, in particular DX ones. Read the full article on dslrbodies.com. Hasselblad's wood carvers just can't seem to be kept in check. Read the full article on sansmirror.com. Fujifilm UK just gave a one-year advance notice of the closing of their E6 lab in Britain. Full details on filmbodies.com. In case you're out of the loop, Nikon has been teasing their next camera release. Read the full article on dslrbodies.com. We're winding down now, but Tony provided me with a bunch of shots, and I wanted to make a few final points (or repeat a few) using them. Read the full article on bythom.com.